Is it a Diamond? Ruby or Garnet? Sapphire or Tanzanite? Emerald or Jadeite? The PRESIDIUM GEM TESTER PROVIDES THE ANSWERS!!! The Presidium Gem Tester provides a quick, easy, laboratory proven way to identify Diamond and separate the most popular Colored gem stones from one another. This valuable tool can eliminate human error when identifying precious gems. 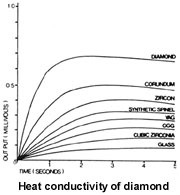 The Presidium Gem Tester's accurate performance is based on the fact that different gem stones conduct heat at different rates. Simply touch the Gem Tester's sophisticated thermoelectric probe to the surface of any Mounted or Loose stone and the specially calibrated dial will show you the relative heat conductivity of the material. Stones as small as 1mm can be tested. The Presidium Gem Tester/Color Stone Estimator Is made under rigid quality standards. It is easy to operate and convenient to own. The light weight portable unit is powered by two (2) AA 1.5 V batteries or the 100/240V Global A/C adapter provided. Calibration is made easy with the two test discs mounted into the frame. The solid state probe pen requires no warm up time between tests and includes a built-in metal detector which will alert you if you have accidentally touched the mounting instead of the stone.